Style, safety and flexible designs are the cornerstones of our WeatherMaster Window Systems. With a variety of wall and window frame colors to choose from you have the versatility to color match your new Sunroom with the existing exterior of your home or cottage. 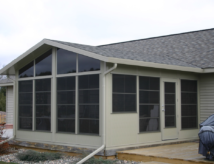 WeatherMaster Window, Door and Enclosure Systems combine the open feeling of a screen room and the comfort and convenience of an enclosed porch. Designed specifically for porches, screen enclosures and even gazebos, the WeatherMaster System is easily installed and can convert any of these areas into your favorite room in the house. With a variety of products to choose from to suit your specific needs and custom applications, WeatherMaster products are an economical way to expand the functionality of any space while adding beauty and value to your home. Made with two inch foam panels and extrusions, the walls incorporate the versatile WeatherMaster 4-Track Vinyl Window System. These window units slide up or down effortlessly allowing a generous 75% ventilation opening! WeatherMaster Vinyl Windows are made with durable View Flex glazed vinyl, and are available in 4 different tint colors: Clear, Smoke Grey, Dark Grey and Bronze. Custom aluminum frame colors are also available! Standard Vertical section width from a minimum 18" to a maximum 52"